Up for a fun-filled activity to kickstart your Sunday morning? 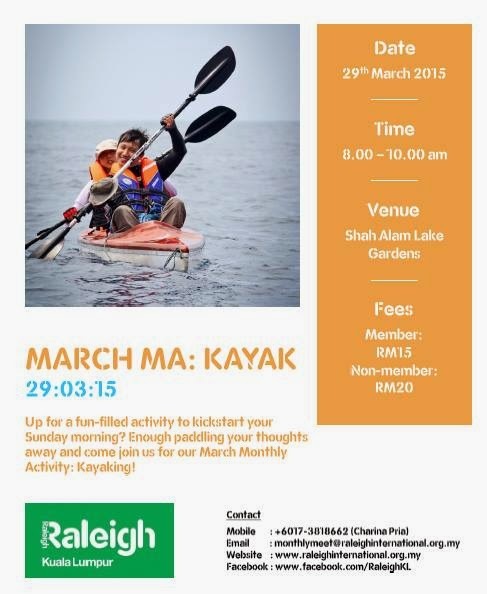 Enough paddling your thoughts away and come join us for our March 15 Monthly Activity: Kayaking! Grab your pals and row away your soon-to-be Monday blues and enjoy the scenic view of Shah Alam Lake Gardens. Also, to those who are partaking in our upcoming May event, RIC 2015, this is definitely a great opportunity to practice your kayaking adroitness and to just have fun at the same time. Register your virtual oar here at: http://goo.gl/Fql3uY and bank in the fees as soon as possible to confirm your registration and to secure your slot as there are very limited spaces only.